To many, the hair on their head is their crowning glory. A good head of hair gives off an image of youth, health and vitality. Unfortunately, not everyone is born with healthy, strong hair. Hair loss is an evil that affects more and more people. With environmental and lifestyle factors affecting the scalp and hair health, many experience brittle hair that falls of easily. There are various triggering factors behind hair loss. Among the most common causes are nutrient deficiency during periods of restrictive diets, stress, changes of mental state, physiological changes, such as pregnancy or breastfeeding, and even adolescence. This type of hair loss is known as a Telogen Effluvium. It is a temporary increase in hair loss, which is described as induced seasonal loss. Seasonal hair loss is no cause for alarm, as there are methods of stopping it. Identify the type of hair loss: The first thing to do is identify the causes of your hair loss. Depending on the causes we could be talking about one-off loss due to pregnancy, breastfeeding, puberty, menopause, malnutrition, genetics, taking medicine or stress. Proper scalp hygiene: Having a greasy and excessively oily scalp can block hair follicles and stifle the roots of the hair, weakening them and preventing hair growth. healthy diet and exercise: Undoubtedly, having the right nutrients and weekly exercise helps maintain optimal health and release stress, reducing the likelihood of major hair loss. What can be done to treat seasonal hair loss? MartiDerm is an innovator in hair products preventing hair loss. 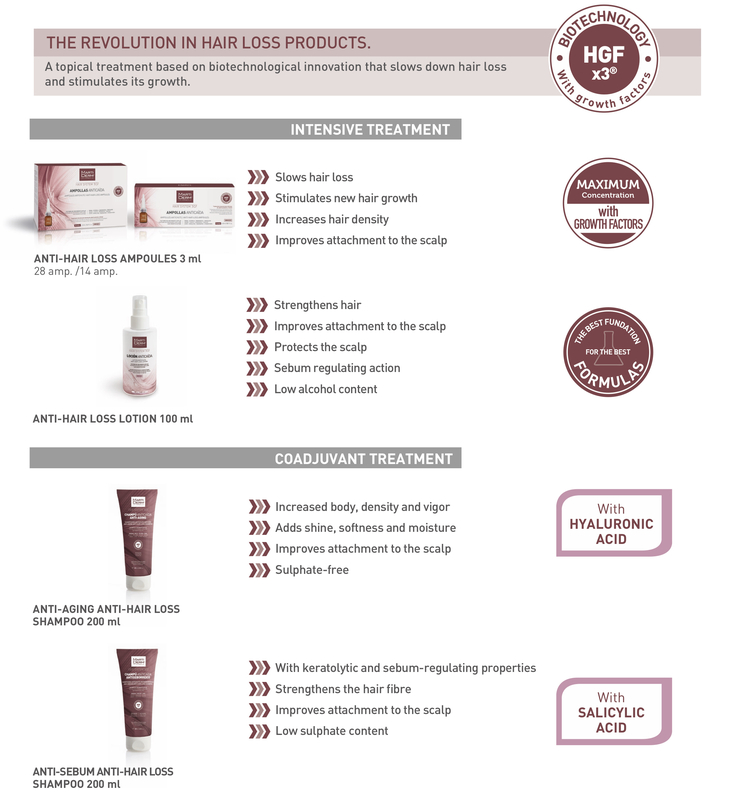 We have revolutionised the hair loss sector with the Hair System 3GF Line. Anti Aging Anti Hair Loss Shampoo with Hyaluronic Acid + HGFx3®Ç: Perfect for dry, weak and brittle scalps. Anti-Dandruff Anti Hair Loss Shampoo with Salicylic Acid + HGFx3®: Corrects and controls excess oil, leaving hair loose and light. By following these guidelines, you can pull the brakes on seasonal hair loss. Enjoying healthy, cared-for hair is possible thanks to the biotechnological innovation of our new hair line Hair System 3GF.